There are few pulp heroes to gain traction since the 1930’s. 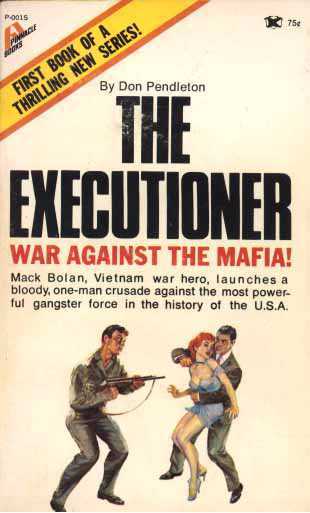 One of those few is “The Executioner” Mack Bolan. Not only did he appear thirty years after the heyday of pulps, he became the most successful character in the entire genre with 600 original novels and counting. Writer Don Pendleton thought that there was a gap in the marketplace for principled men of action. It was this same gap in Hollywood in the 1970’s that lead to the rise of Schwarzenegger and Stallone. Men crave strong role models and Dustin Hoffman wasn’t it. Bolan was different than pulp heroes who came before. Characters like Doc Savage, who at least tried not to kill, and always stayed on the right side of the law. In War Against the Mafia Bolan pretty much breaks all the laws. I don’t need to say much about the character Mack Bolan because he is Frank Castle for the most part. The only difference is that instead of his family being targeted directly by the mafia for termination, they die indirectly. The details are grim and I could see how that experience would make any man go insane with rage. Bolan even throws his military career away just to make them pay. But Bolan is a man of principles and mere revenge isn’t a very principled stance. He is killing the mob so that they can’t hurt anyone else again. He is not content killing the few who destroyed his family, no, he must kill them all. Going from city to city, leaving a trail of bloody bodies. The story isn’t enough for one novel and Bolan’s war with the mob is not concluded until book #38 Pendleton’s final Executioner story. The rest of the series would be written by ghostwriters. Pendleton (who died in the 1995) was a Robert Heinlein/Bob Howard kind of tough guy, the likes of which you don’t see too often anymore. But the Executioners legacy lives on and you can still find out what Mack is up to at your local book store… book store did I say book store? I mean Amazon.com. 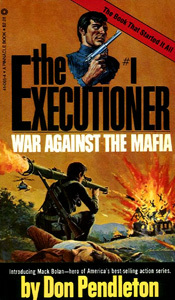 Apparently Bradly Cooper has control of the rights to The Executioner and is finally developing a feature film about him. © 2019 crowblog All Rights Reserved.